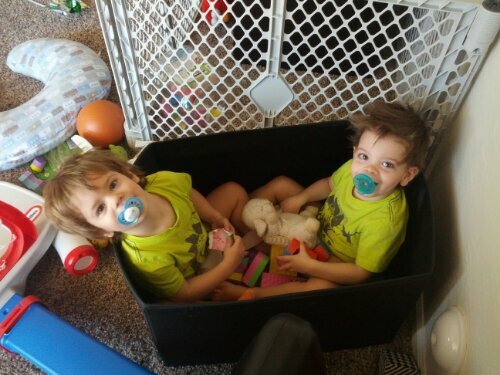 Ashton & Dylan’s 2nd birthday is coming up soon (Sept 14th)! It’s never a dull moment in toddler land. Lately it’s been a whole lot of screaming, throwing things and of course, making huge messes everywhere. 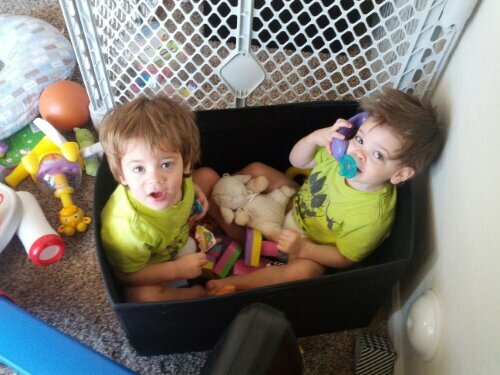 Today the boys both crawled in the toy box and were chillin. Dylan was chillin so hard that his peeps were calling him up on the baby celly. 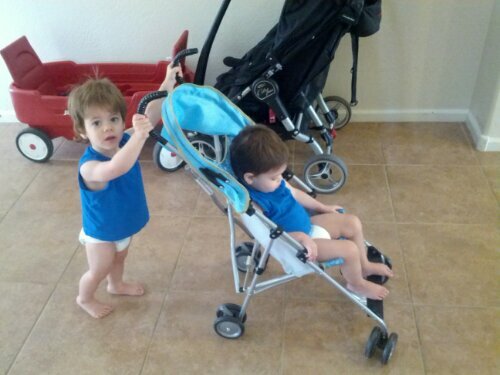 Yesterday we broke out the single stroller and the boys took turns pushing eachother around the house. There was also some peekaboo, laughing and head petting involved. 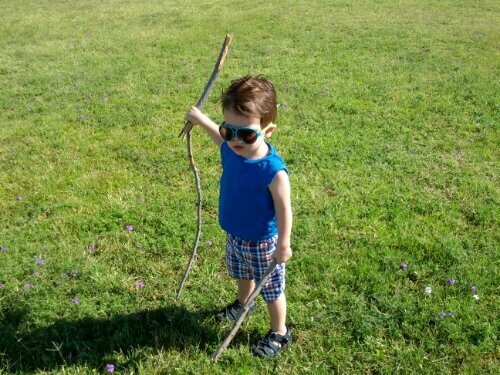 We also let the boys run around the park and everyone found some sticks to carry around. 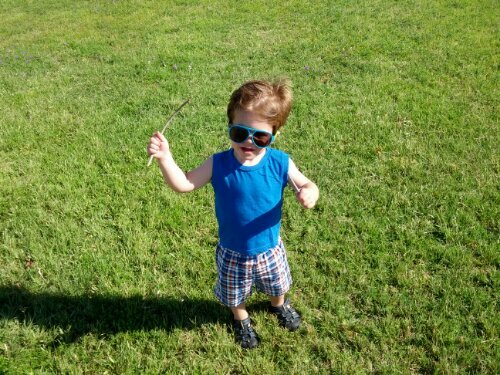 Dylan found some BIG sticks. It’s always a fun time when we have the boys engaged and an activity to do, but these last couple of weeks their tolerance for playing on their own without our attention has dwindled. 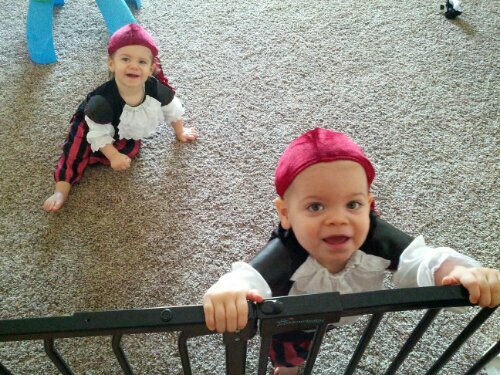 Of course we’d love to give them attention all day, but we have to get things done around the house! But don’t get me wrong, even though it can be frustrating sometimes, every day the boys do something that makes me laugh or smile, which makes it all worthwhile. I couldn’t imagine life without these two cute little human tornadoes in our household. Arizona residents! As the end of year quickly approaches, I would like to bring your attention to 2 state tax credit programs that I highly recommend that you take advantage of. 1) Working Poor tax credit. Get a 100% tax credit for all money donated to a qualifying AZ charitable organization, up to $200 for individuals and $400 for married couples. Please take advantage of these fantastic state tax credits and support your local community! 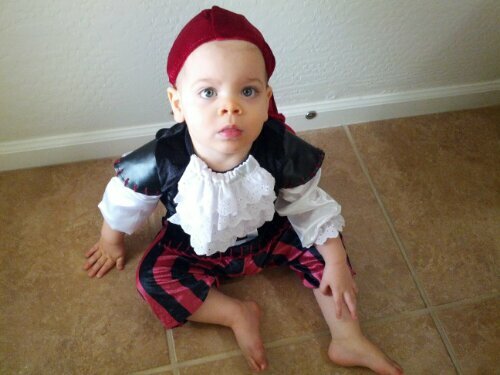 Posted on October 31, 2012 Categories random2 Comments on Happy Halloween! Help us raise funds for Farm Sanctuary! 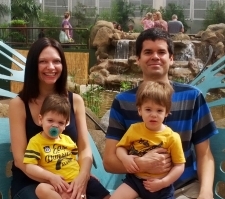 Dear friends, our family (Wes, Tera, Ashton & Dylan) are participating in Farm Sanctuary’s Walk for Farm Animals 2012 charity event. Please help us with our fund raiser! Every year millions of farm animals are subjected to unspeakable abuses on factory farms. Often confined in cages so small they cannot even turn around, farm animals are regularly beaten, mutilated, force-fed, deprived of everything that is natural to them, and frequently dragged to their death. For more than 25 years, Farm Sanctuary has taken a stand against such cruelty by inspiring change in the way society views and treats farm animals and by promoting compassion. This year I am joining Farm Sanctuary in its mission to protect farm animals from abuse by participating in the Walk for Farm Animals. A series of fundraising and outreach events held across the United States and Canada, the Walk for Farm Animals spreads Farm Sanctuary’s message of compassion while supporting the organization’s life-saving work. I am walking with Farm Sanctuary to speak out on behalf of animals and to make a real difference in their lives. I hope you will join me in taking a stand against cruelty to animals. Farm animals everywhere are relying on your support! Please make a donation of $10 or more to our fundraising page today! Posted on October 20, 2012 October 20, 2012 Categories family, nature, personalLeave a comment on Help us raise funds for Farm Sanctuary! Do you think organic food is expensive? Hard to find and inconvenient to search out? If so, then you probably haven’t heard of Nature’s Garden Delivered. 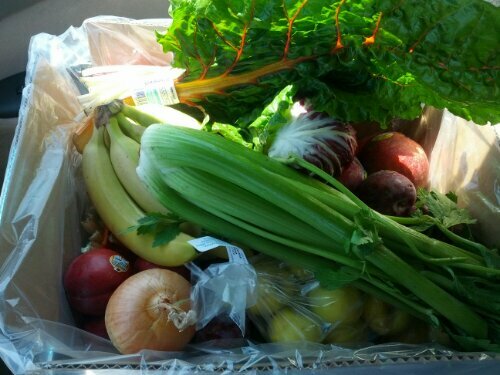 Just about every week, I get a big box of high quality, 100% organic produce from NGD. Their produce is high quality, delicious and we feel good knowing that no pesticides, herbicides, other dangerous chemicals or genetically modified organisms are involved in our food. Their pricing is affordable and you can’t beat the convenience of having your produce dropped off for you right on your doorstep. These guys make organic eating easy! I would highly recommend that you check them out. 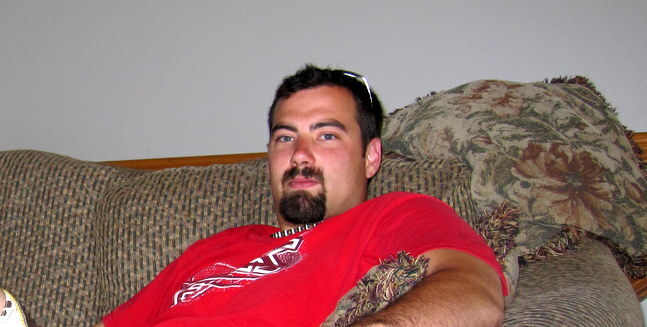 My brother in law, Preston Howard, passed away just over 2 years ago on this very date. He was 25 years young. Preston was a good man, good family and a good friend to many. Even now, it is tough to fathom that he is gone. It’s one of those things where your mind finds it difficult to comprehend or process the concept of it all. He should just be there, hanging out with us, the next time we’re there in Utah. That seems like the more normal and real situation, but unfortunately, it is not. I am thankful that we got to spend that one last time with him in July 2010, while Tera and I were there in Utah celebrating our wedding. It is somewhat comforting to know that he was able to partake in that one last celebration with loved ones, family and friends. We had a great time with Preston on that trip and we’ll certainly never forget it. It’s easy to remember the many good things about Preston, including his laid back attitude, chill mannerisms and his willingness to help his friends & family in need, no matter the situation. Preston loved skateboarding and snowboarding, much like myself. In recent years, he had rekindled his interest and we would often talk about going out to skate. On most of my visits to Utah, I would usually leave my board back home in Phoenix, as it’s a hassle to lug it around through the airport and on to flights. Prior to our trips, Preston would always ask me if I was going to bring my board and was always hyped on us trekking out to skate together. His enthusiasm actually inspired me to buy a new board while I was in Utah, so that I could leave one there and skate whenever I visited, without having to worry about transporting a board. The day that I bought that new board in Utah, our cousin JT and I went out skateboarding at one of the public parks in Salt Lake City. We were calling & text messaging Preston all morning, as we had already made plans to go skate with him that day. We couldn’t understand why he wasn’t answering, but we chalked it up to a depleted phone battery or something of that sort. Later that day, we learned the unthinkable, Preston had passed away early that morning. I didn’t get to have that one last session with Preston, but he’s in my thoughts often, especially when I’m out skating. I know that he would be stoked to see that I’m out there shredding Utah, whenever I visit now. Wish we had more time with you on this Earth my man. We miss & love you brotha. Peace. Hot on the heels of Dylan learning to crawl (traditional method), Ashton is now getting himself mobile via the worm crawl. It is pretty hilarious to watch him get all excited and then use this method of movement to get himself where he wants to go. Check out the video below to see him in action! Video: The boys laughing & Dylan learns to crawl! Watching our boys explore their world and learn new things is an amazing experience to behold. We try to capture many of these precious moments through photography and videography, and thankfully these days our powerful smartphones allow us to do that with ease. Below are a few of our favorite videos from this month. 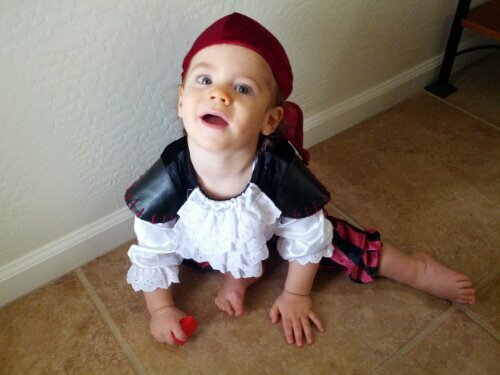 We hope that you enjoy watching our little ones crack up laughing and Dylan learning to crawl. 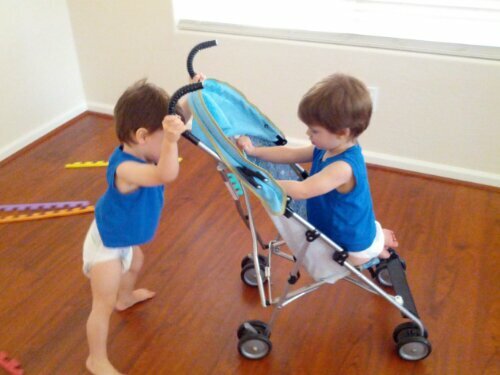 Posted on June 23, 2012 June 23, 2012 Categories family, personalLeave a comment on Video: The boys laughing & Dylan learns to crawl! Today marks the second day and most likely the third night that I’ll be in Banner Thunderbird Hospital with 6 month old Ashton. The little man caught a nasty cold that has impaired his respiration and caused him to stop eating, which lead to dehydration. The first night he was put on oxygen due to his o2 count dropping into the 80’s at one point. This level has to remain at 90 and above to ensure he’s getting enough oxygen. He was also put on IV to treat dehydration. Thankfully yesterday afternoon they saw improved oxygen levels and he has been off the breathing tubes since then. I think the tubes really irritated him so I’m glad we don’t need them anymore and happy he can breathe well enough on his own again. He’s still dipping into 89 and 88 occasionally when he’s sleeping, but lower levels during sleep are expected and he usually recovers quickly back into the 90 range. 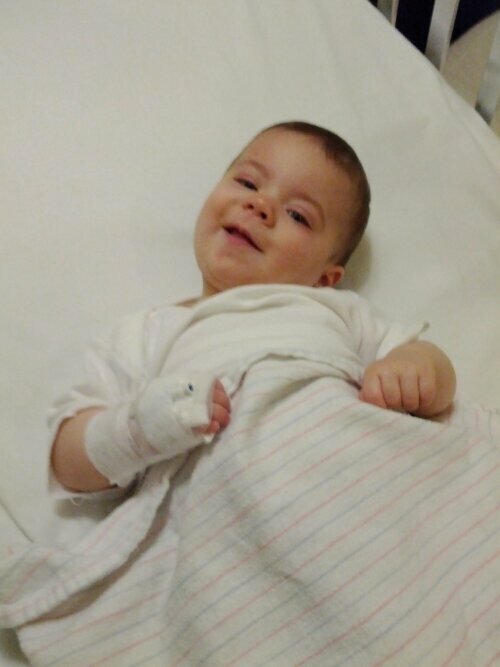 He does seem to be in better spirits today, but the doc says we have a 50/50 chance of staying the night again. He’s also still not eating much, so they turned down his IV fluid levels which we hope will improve his appetite. He has an insane amount of congestion and snot, which we have to routinely help extract using an air suction powered nasal aspiration device. Infants don’t have the full capacity to deal with all of these excess secretions as their tongues and coughing abilities aren’t strong enough yet. This is what causes the breathing difficulty. This is one nasty cold that both Tera and I already suffered through and it pains me deeply to see our little boys struggling and in distress while trying to fight it. Unfortunately Dylan has also gotten sick, but I’m hoping with all hope that he doesn’t get as bad as Ashton. 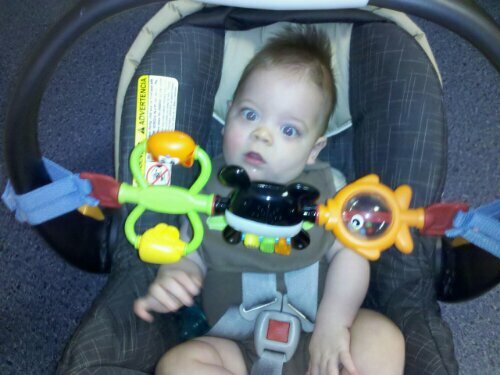 Tera is taking Dylan to our Pediatrician’s office as I write this. 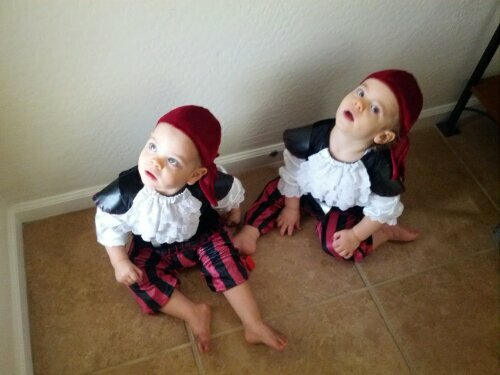 Hope my little boys can both kick this virus soon. I can’t wait to see my babies happy and playful again as they normally are.